This weeks JAI challenge is just add balloons. Perfect timing because a little friend of mine is turning 3 on Saturday. I decided to use the happy little monkey from the Fox and Friends stamp set. The balloons are from the Owl occasions set (which I love) from the Christmas Mini. Such a sweet card and I'm sure your little friend just love this cute monkey card!! So lovely to see your entry this week Nadine. A very sweet take on this weeks challenge Nadine, l'm sure it was a hit with the birthday boy! Ohh very cute. Far out 3!! My how time flies. Happpy Birthday to Asher and Hi to Anne, Matt and Taylor too. 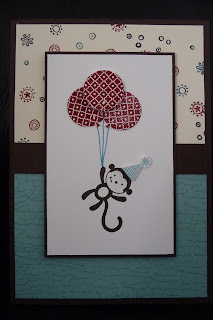 The image of a little monkey being carried away with balloons made me smile :) This is such a sweet card. Thanks for playing along with us at Just Add Ink this week! Too cute! Love this and I'm sure it will be loved by Master 3 also! Great to see you here playing with us Nadine.